We coined the phrase "Industry Standard" hitch and there's a good reason...we're good at making them and our hitch lines are versatile to serve you best! The ISR Series of SuperGlide hitches remain our top sellers, and with good reason. They're built tough, they're reliable, versatile and affordable! Let's start from the top and work our way down and see what makes these ISR SuperGlide's such a great buy! WHY WE'RE A HEAD OF THE REST! There are many hitch designs on the market today, and just like any product, they all have their selling features, but if you plan on buying a hitch, let’s really focus on the things that matter most when towing; a comfortable ride, confidence in a safer product, and ease of use; and it may surprise you to know that nearly all of that has to do with the hitch head itself. As you can imagine, a great deal of force is encountered when you tow. The king pin of your trailer is constantly being pulled back and forth, and side-to-side inside the jaw of the hitch head; metal rubs against metal and wear points can occur. Wear is common across the board, but how the wear is distributed and how much free space the king pin has to move around in the jaw is essential for a great trailering experience. 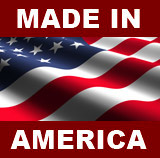 Our precision tolerances are achieved by laser cut, USA-made, superior grade American steel from parts that we manufacture right here in Indiana. The head is easily removed by pulling two pins, making getting your hitch out of the bed a much lighter task. Hooking up is easy and uncomplicated, unlike other hitches on the market. No getting in and out of your truck multiple times during hookup. No getting dirty leaning over a high truck bed to reach safety pins and latches to keep from dropping your trailer. We have put together a comprehensive page on just how different our hitch plate compares to others on the market. Click here to see why PullRite hitch plates perform better and with little to no effort! Do you want 8 holes drilled in your new truck frame, or would you rather have a hitch and mounting kit that is designed to bolt to the existing holes already in the frame? 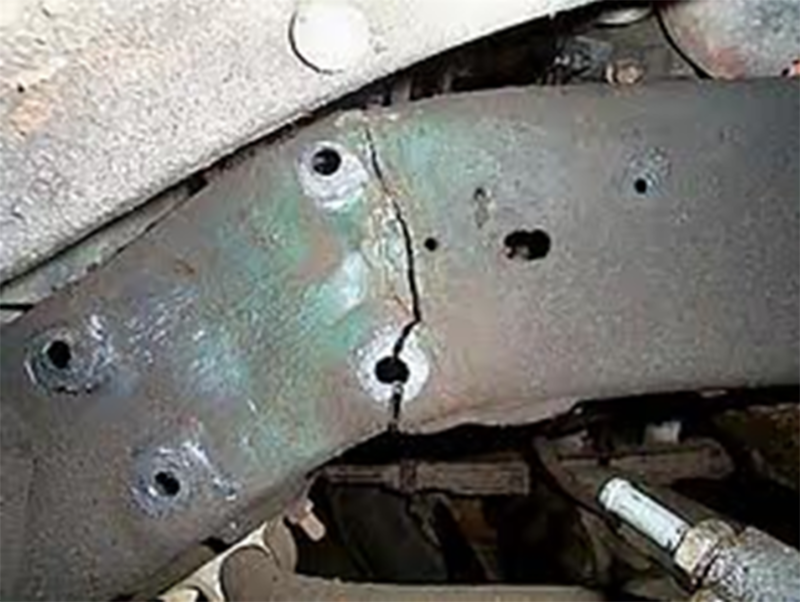 It’s common sense, drilling additional holes in the truck frame weakens it over time. 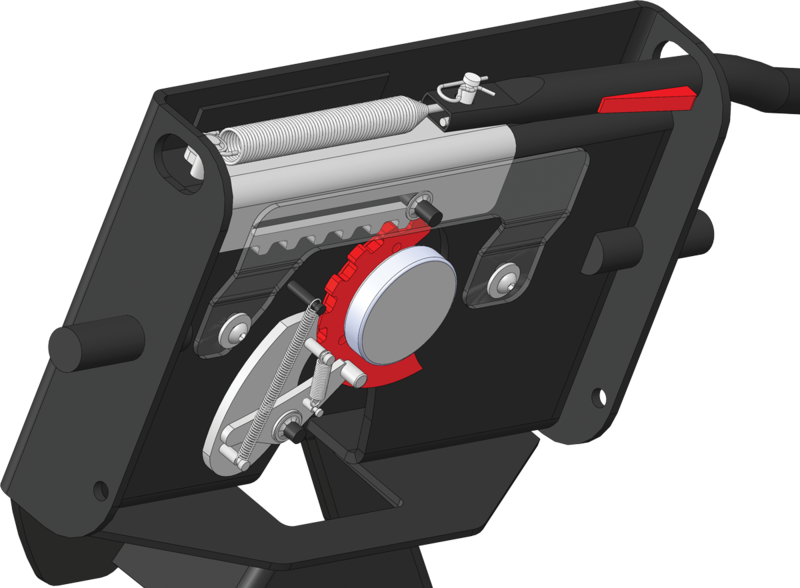 PullRite has NO-DRILL custom brackets options for all our ISR model hitches. 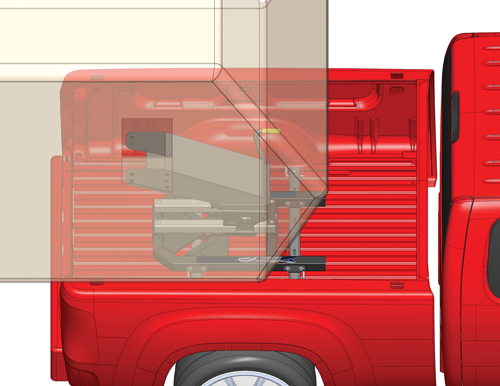 Do you want a more secure, stable, stronger towing platform? We have better mounting bracket designs. Our Mounting Brackets are constructed of a higher quality steel, and undergo SAE J2638 testing for strength and performance. Custom Mounting Kits are the fastest installs in the industry because they’re designed specifically for your truck’s frame, and in most cases, no drilling is required. So much innovation has been packed into these 20K bracket designs, most installs are a one man job! Custom Heavy Duty Mounting Kits and Rails offer the same advantages as our 20K Custom Brackets, but with a heavier weight rating for towing today’s luxury coaches and toy haulers. Designed for use with our #2300 SuperGlide and #2200 Super 5th ISR HD hitch models for maximum performance! 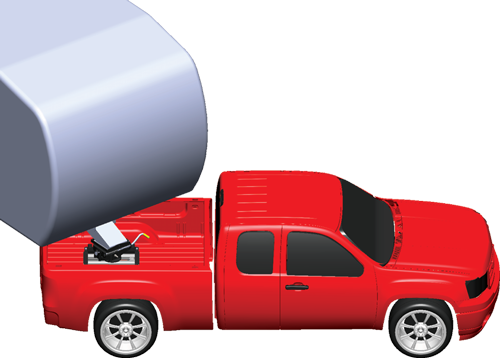 SuperRail Mounting Kits utilize PullRite’s patented ‘Clean Bed’ technology, giving the full use of your truck bed back to you. 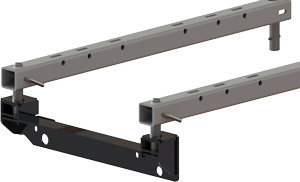 No longer are you stuck trying to work around your fifth wheel rails. Simply unpin your hitch, unpin the rails, and give the mounting posts a twist. Everything lifts out, giving you a clean bed—no tools required! One of the most desired feature of any hitch is quick, easy installation and removal of the base rails so you can have a clean truck bed when you're not towing. We have it and we call it Clean Bed Technology and it's a feature that comes standard with all our SuperRail mounted hitches! SuperRails are quick and easy to install and remove. As you can see in the short video here (bed removed for illustration purposes), the steps to installing and removing the rails from the mounting system is as easy as turning the posts and removing/installing hardware. That's it. Nothing complicated. Obstruction free when removed. Quick and Easy. No tools required! Here's where PullRite hitches really "shine." We have been making our truly, fully-automatic sliding hitches for short bed trucks for a long time now...actually before there even was such a thing. We saw that manual sliders weren't working well for the driver, sought to improve upon the design, and we feel we knocked it out of the ballpark! Especially since other manufacturers have tried to hijack our designs...so we must be doing something right?! Our Industry Standard line of SuperGlide hitches for short bed trucks continue the tradition of quality you expect from PullRite! Whether you’re upgrading your existing hitch or installing your first fifth wheel, we have a solution for you! The ISR Series offers you more safety and ease of installation than any other manufacturer in the industry. 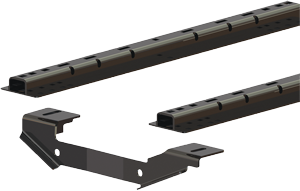 Our Custom Mounting Bracket Kits and Bed Rail systems are made from high quality steel, precision laser-cut parts, and most require no drilling of your truck’s frame to install! 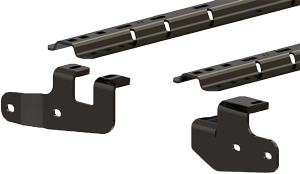 PullRite ISR hitches are compatible with industry standard bed rails. So if you already have a standard fifth wheel system installed in your truck, keep what you have, or upgrade to a better system with our ISR Mounting Kits and Rails. It’s just that easy. 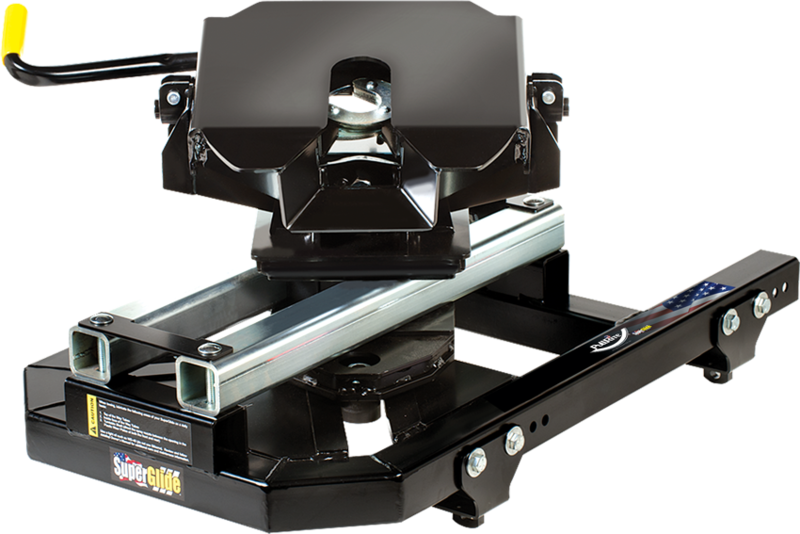 The SuperGlide is the ONLY Fully Automatic adjusting fifth wheel hitch for short box trucks! The SuperGlide moves automatically during turns and eliminates stopping and getting out of the truck. No need to remove pins, release levers or try and get the trailer to drag the hitch along the rails when you want to make a turn. 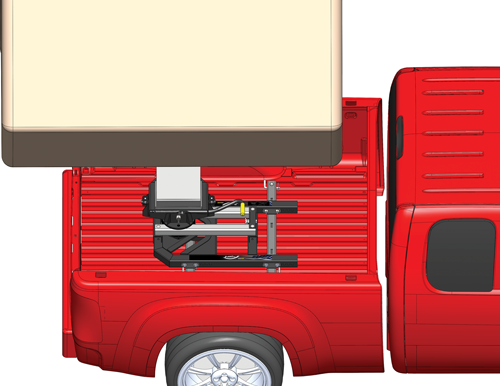 The required Capture Plate mounted to your trailer’s king pin box makes it fully automatic, and works with the full articulating, dual-tilt head, to minimize twisting and material stress, giving you maximum towing PERFORMANCE! 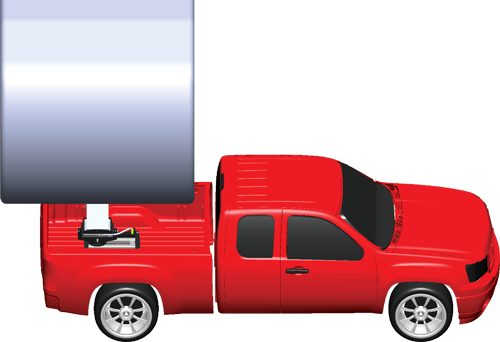 Hitch is in forward position for highway towing, with the trailer weight over the rear axle. As you begin to turn, going forward or reverse, the SuperGlide cam arm automatically moves the hitch and trailer away from the cab. The more you turn, the more the trailer moves away. The SuperGlide can move back far enough to allow a full turn. You never have to anticipate, never get out of your truck, never throw any switches or levers. It’s AUTOMATIC...you JUST DRIVE! In a class all by itself! Super Short bed trucks, or trucks with less than a 6' bed, are widely popular, but since the manufacturers decided to extend cabs and reduce the wheel base even further, a challenge has been created for RV'ers with this type of truck. We have the solution! 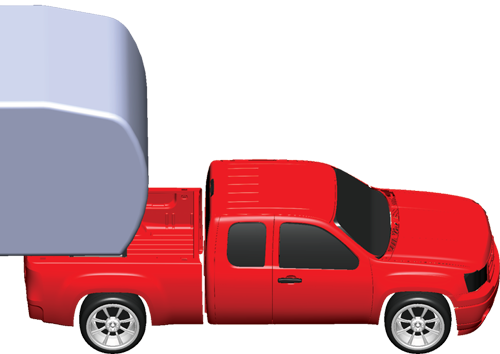 PullRite offers a SUPER, SHORT BED SOLUTION for those of you towing a fifth wheel trailer with a truck bed shorter than 6 ft.! The #3100 SuperGlide automatically moves the trailer away from the cab while making turns - allowing up to 90° turning without stopping, slowing down or even thinking about the space between the truck and trailer—and then automatically returns the hitch and trailer to the safe towing position over the truck axle when the turn is completed. 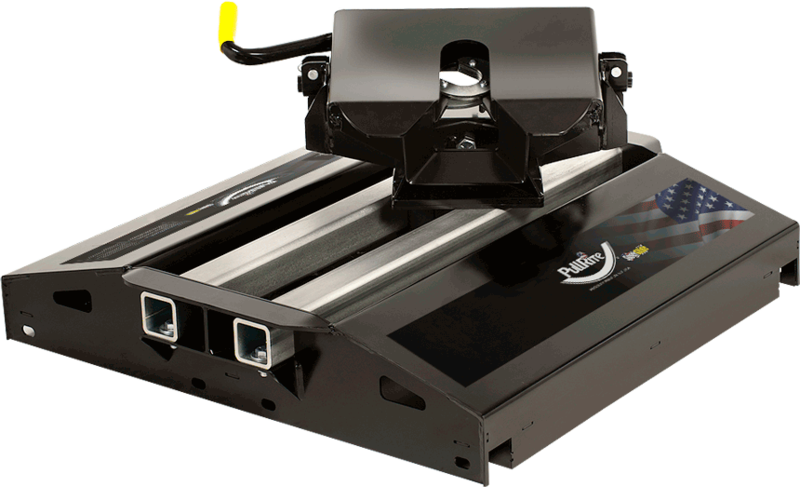 SuperGlide is THE best Fully-Automatic adjusting fifth wheel for short box trucks. The required Capture Plate mounted to your trailer’s king pin box makes it fully automatic, and works with the full articulating, dual-tilt head, to minimize twisting and material stress, giving you maximum towing performance. 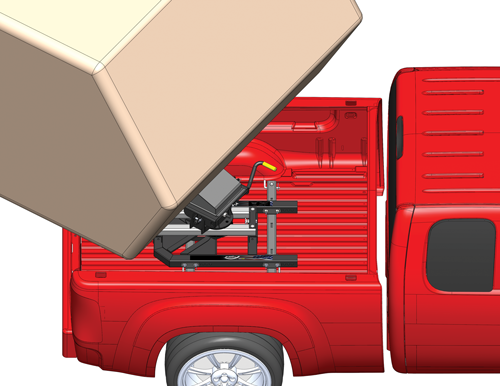 #3100 Mounting Brackets are custom to each truck model, install quickly, and leave you with a clean bed!